Elegant vintage inspired wedding invitation featuring decorative swirls and flourishes on a rustic antique textured background. Flemish Script for bride & groom lines and reception time line. Copperplate Condensed Bold for lines of host, request, location, time. Industrial 736 for date info. Flemish Script is a formal script typeface designed by Monotype Design Studio. It features looped ascenders, connected letters and strongly flourished capitals. It is a formal yet elegant typeface that can be used in your wedding stationery. 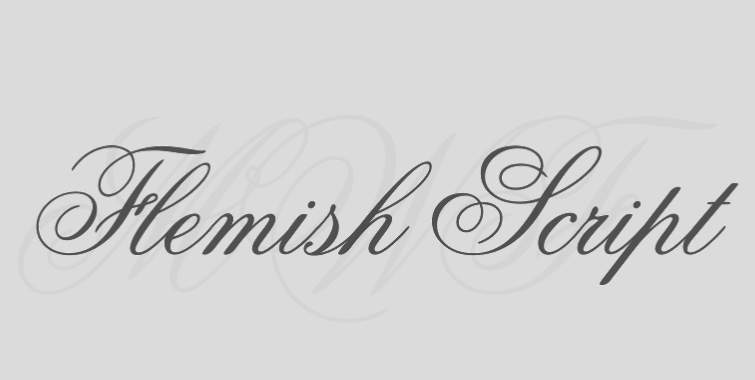 You can buy and download Flemish Script at Myfonts.